A pair of French late 19th century highly decorative walnut chairs, with Spanish tooled leather seats & back supports, of exhibition quality. 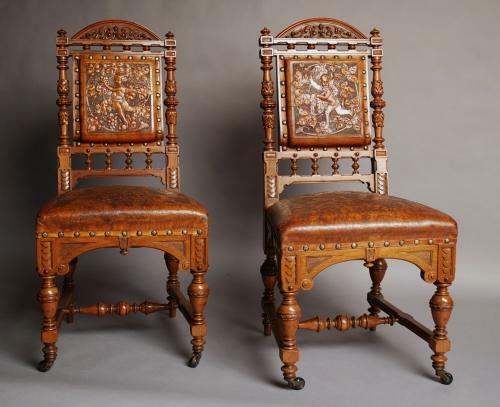 These chairs both have a shaped top rail with a finely carved foliage decoration. The back supports have turned finials at the top leading down to a turned and carved design of stylised acanthus of exceptional quality. Each of the leather backs have superb embossed images of putti amidst foliage. The seats also have embossed leather decoration of stylised foliage designs, the seats have a slightly worn appearance as seen in the photographs. These chairs are of the finest craftsmanship.